"Triage" is actually a French medical term, derived from the verb trier, meaning sort or select. It's concept is very interestingly applied to software quality assurance. The term is used in the context of determining the priority of patient's treatment based on the severity of their condition. The severity status of a patient can be classified as the following- those whose death can't be avoided by any kind of treatment, those who will recover even if not attended and those who will recover only if aided. Similarly the term is used in software quality assurance to assess and prioritize new defects. Priority is assigned to a defect according to the degree of risk involved in it. Priorities are marked as - critical, high, medium , low. Severity is the seriousness or degree of criticality of a defect. This graphical representation clearly states that degree of severity is directly proportional to its priority. 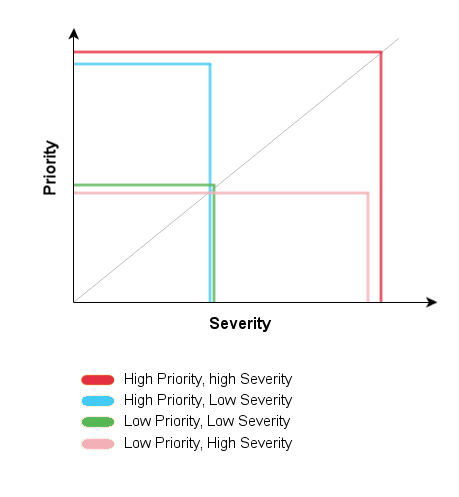 The defect with highest severity has the highest priority and the one with lowest severity has the lowest priority. The defect triage system has a certain flow. The bug triage team sits together and prepares a plan. They review the defects in the light of the available resources to fix the bugs. Defects are analysed and assessed on the basis of the degree of their severity. Finally a consensus is reached after a step by step analysis of the defects , and it is decided whether the defect is to be monitored or can be removed from list. The first and foremost aspect of bug reporting is to specify clearly the type of bugs , so that the developer is in a position to gauge the volume of defects and plan a strategy accordingly. To ensure that the defect is mentioned under the right project or module. Categorise the bugs to fixed, that is, the bugs that needs immediate attention and those that can be addressed later. The bug detection is a very important step in the software testing phase. It enables the developers to analyse the errors and find an appropriate solution to it. Hence the bug/defect triage is gaining momentum in software quality assurance.